Happy Wednesday! 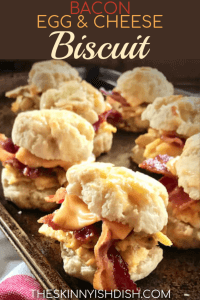 I’ve got your new favorite breakfast biscuit recipe here for ya today! Okay, y’all. It’s NO secret that I love breakfast sandwiches, perfereably the kind with bacon, egg, and cheese on them. I also really love biscuits! The only way I was able to get the biscuit-ey, bacon-ey, egg sandwich before these guys was by making one of those bubble up creations. 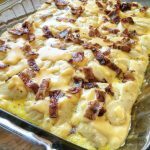 See: Bacon, Egg, and Cheese Biscuit Bake. Now, I REALLY love that bubble up a lot. It’s super easy, delicious, and tastes just like the one from the golden arches, but you know, sometimes I want something that’s basically the real deal without being the real deal. Enter: The “Two Ingredient Dough Craze”. A couple’a weeks ago I made these Garlic Parm Drop Biscuits that I posted here. 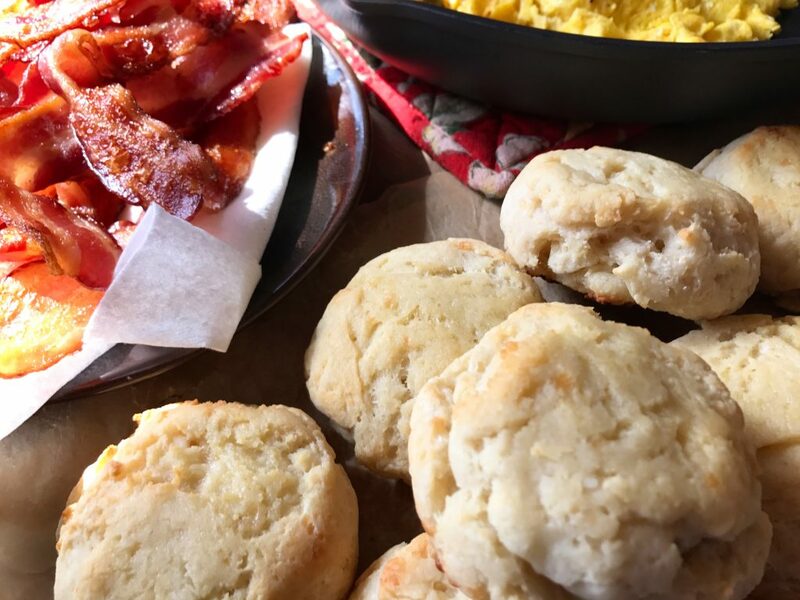 One morning, I was fumbling around in the fridge and saw leftover biscuits and bacon. I put the two together with an egg and it was magical. It wasn’t just magical, it was perfect. I honestly couldn’t believe it. 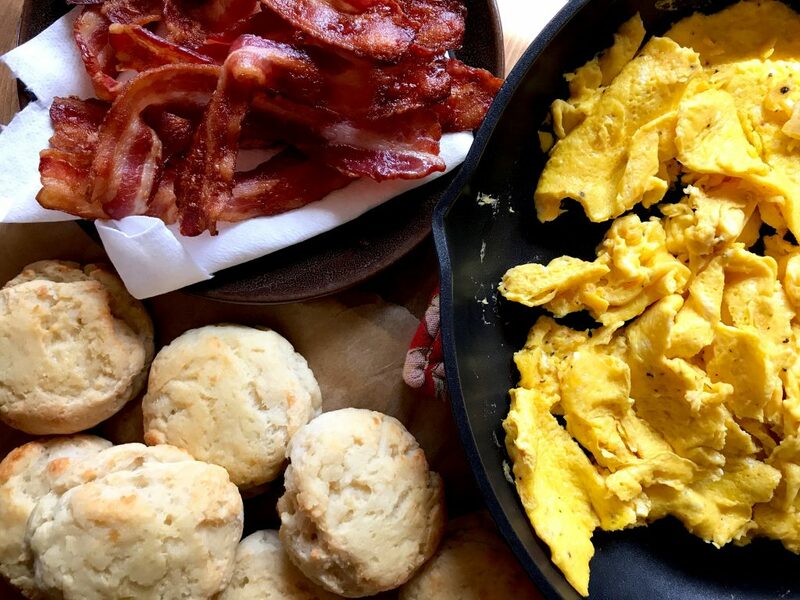 I figured my brain was playing tricks on me so I made a fresh batch of bacon, biscuits, eggs, etc and I made Eric eat them too and I was like, “I’m crazy, right?” There’s no way that these are this good. And guys, he couldn’t believe it either. 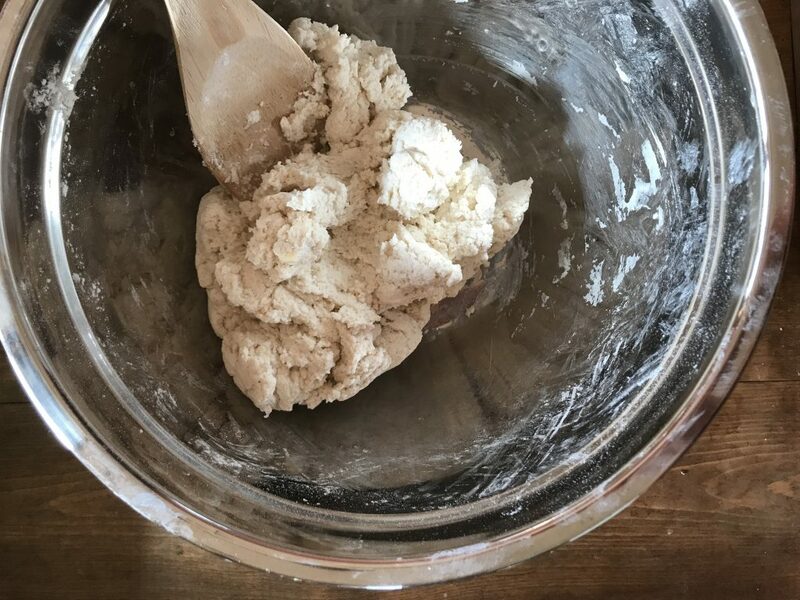 I don’t know WHY this dang dough works so well in so many different ways, but it does and I am so glad that it does. 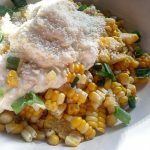 One of the best parts about it is that it’s SUPER easy to whip up. It does take just the tiniest bit of upper body strength while mixing (which I don’t have, haha! ), but it takes just minutes to get it mixed up and on a pan in the oven. 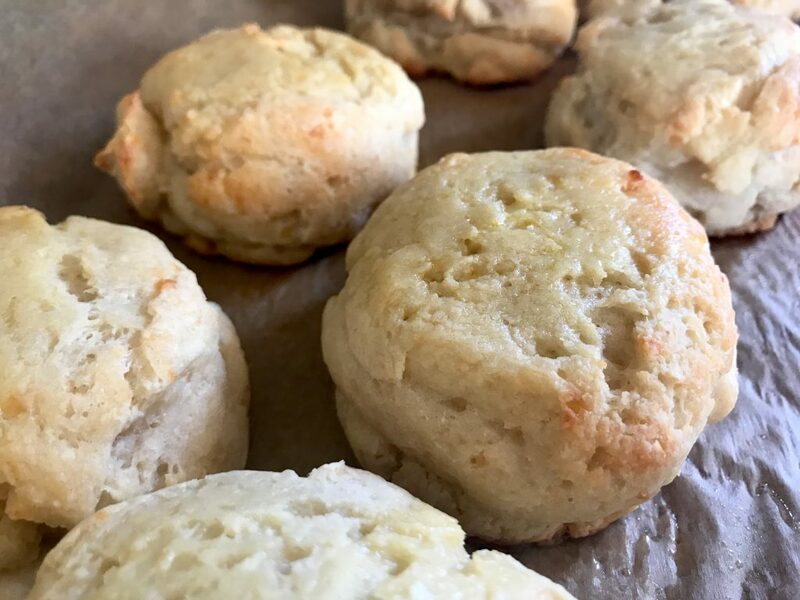 I feel like I should warn you that these are surely not your grandma’s buttery flaky biscuits, but they are a REALLY, REALLY spot on delicious and healthier substitute. Plus?!? they are packed with protein which helps keep ya fuller a bit longer and I can always use help in that department. There’s just nothing bad about’m. At least not that I’ve run into just yet. 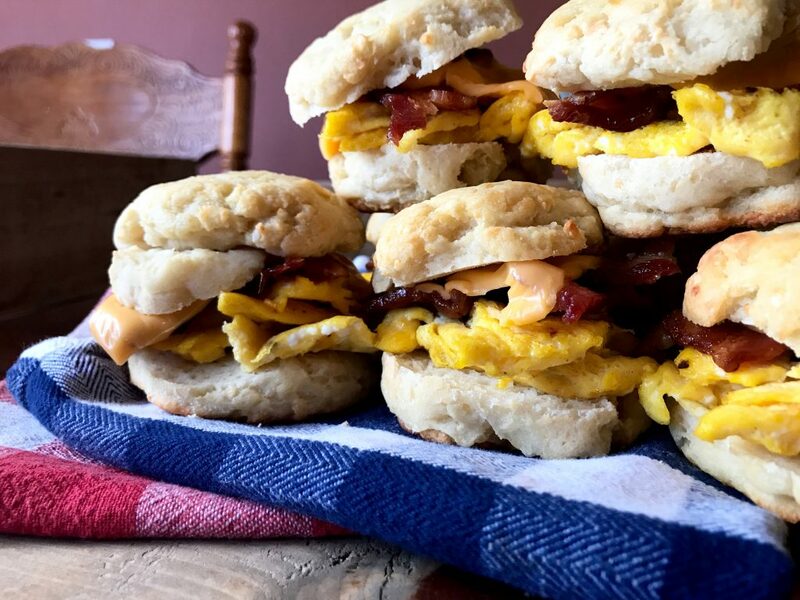 I went ahead and decided to post these Bacon, Egg, and Cheese Biscuits using my garlic parm drop biscuit recipe with just a few adjustments, mostly just to make the biscuits a bit larger to make it a proper breakfast sandwich size. I tested them out to see if they would go over well being made ahead and throw’m in the freezer for some easy peasy meal prep options and guess what? they did great! 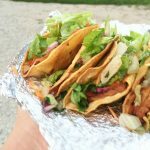 Make these soon, y’all! 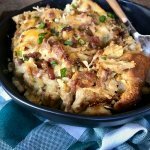 They make for the perfect make ahead grab and go option for crazy busy week days, but they also are the best for weekend breakfast/brunch! 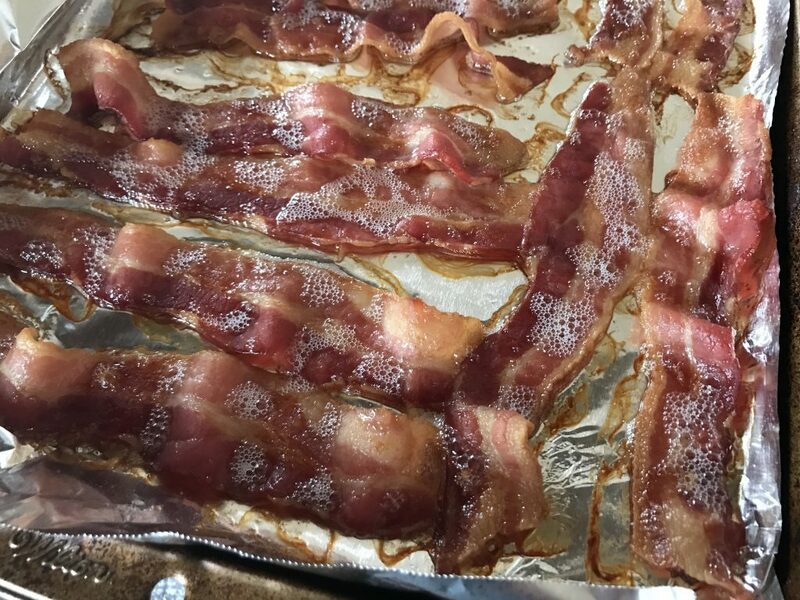 Preheat your oven to 400 degrees and let’s start off by throwing some center cut bacon on a sheet pan (covered with foil) in the oven for about 12-14 minutes. (or until bacon is crispy) You can make it on the stove top too, but I have found that this is the quickest way to get a lot of bacon done at once. While the bacon is cooking grab a bowl and add 2 cups self rising flour, 1 tsp garlic powder, and 1 tsp kosher salt. Stir together. Add in 2 cups of non fat plain greek yogurt and 1/4 cup parmesan cheese. Mix with a spoon REALLY, REALLY well. I use a wooden spoon. Do ya see those crumbly pieces at the bottom? You’re done mixin’ when they are completely gone. And you’re done mixing basically when you need a new arm. Just kiddin’. It really isn’t that bad, I promise. I have like zero upper arm strenght and I am also a big whiner. When there are no more flour bits & pieces and the bowl is basically “clean” again. You’re good to go! Now, (this part is kind of important) You’ll need a 1/3 cup measuring cup for the larger biscuit size. Spray the measuring cup with cooking spray to make it easier to “drop” the biscuits. You might need to spray it a couple of times. Scoop the dough into the measuring cup and drop onto a baking sheet that is lined with parchment paper. Make sure you drop them about’a inch apart. It’ll make 9 drop biscuits. You can kind of smoosh them just a bit with your fingers to look just like a regular ol’ biscuit. Spray the tops of biscuits with some olive oil or butter cooking spray. Now your bacon should be done, take it out and lay it on some paper towels to sop up a bit of the extra grease. 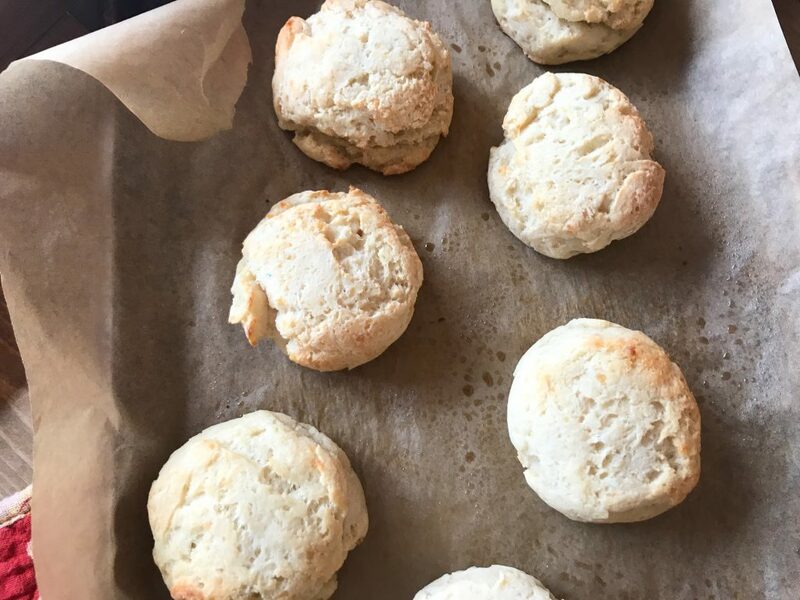 Pop your biscuits into the 400 degree oven and let’m cook for about 24 minutes, or until tops are lightly golden brown. If you’re wondering what Pepper is usually doing while I am photographing recipes. 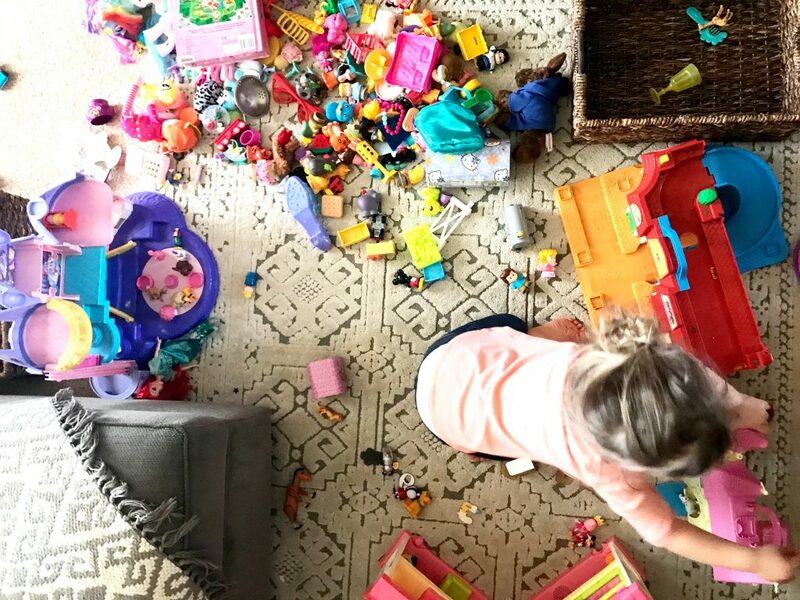 The answer is this: making a giant mess. This might seem like there’s a lot going on, but trust me it’s a really smooth process and the outcome is incredible so it’s well worth the few extra dishes in my honest opinion and that’s comin’ from your girl who hates extra dishes. Now, while you’ve got your biscuits in the oven get your eggs ready. I normally wait until the biscuits have about 5-10 minutes left to start the eggs just so they aren’t sitting for too long, but do whatever works for you. If you’re making these to throw in the freezer you can make’m right away and let’m sit and cool. 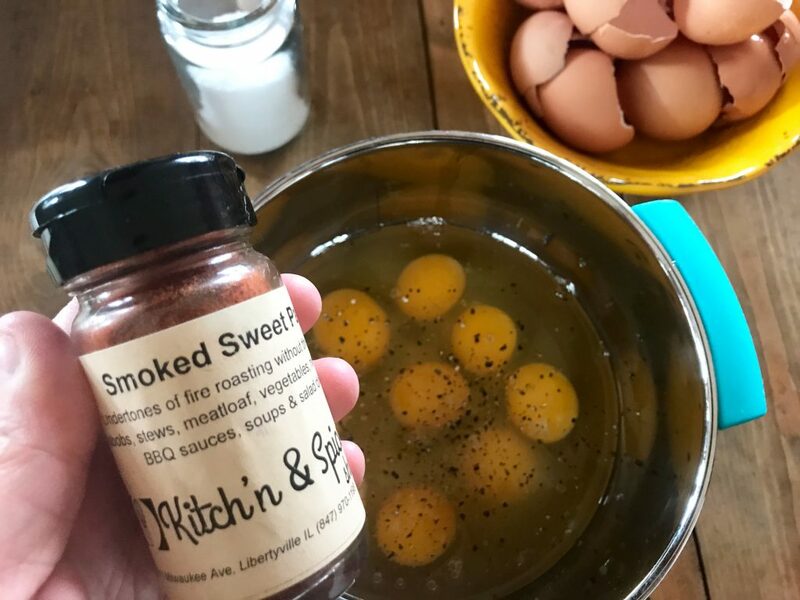 Take 8 eggs and add a couple pinches of salt, a pinch of pepper, and I personally love to add a couple pinches of sweet smoked paprika. It’s from a specialty spice shop, so I don’t know if you can find it in a regular grocery store because I’ve never checked. If you don’t have it, trust me, it’s not necessary, but it does add a bit of magic to your eggs if ya do! First step to delicious eggs: BURNER ON LOW. No if’s, and’s or, buts. Turn it on low and don’t question me or yourself. 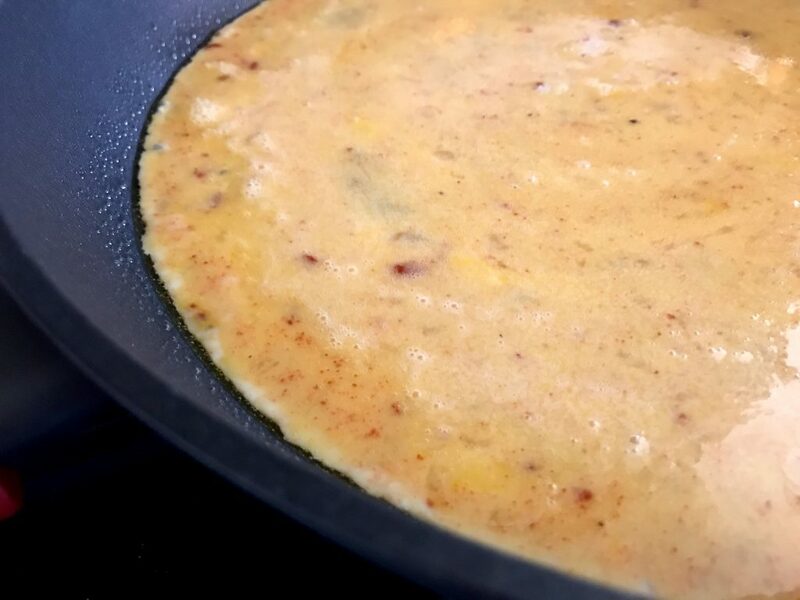 Let your skillet warm up for a couple of minutes. Next up, This is my secret ingredient to getting the “buttery” taste to eggs. 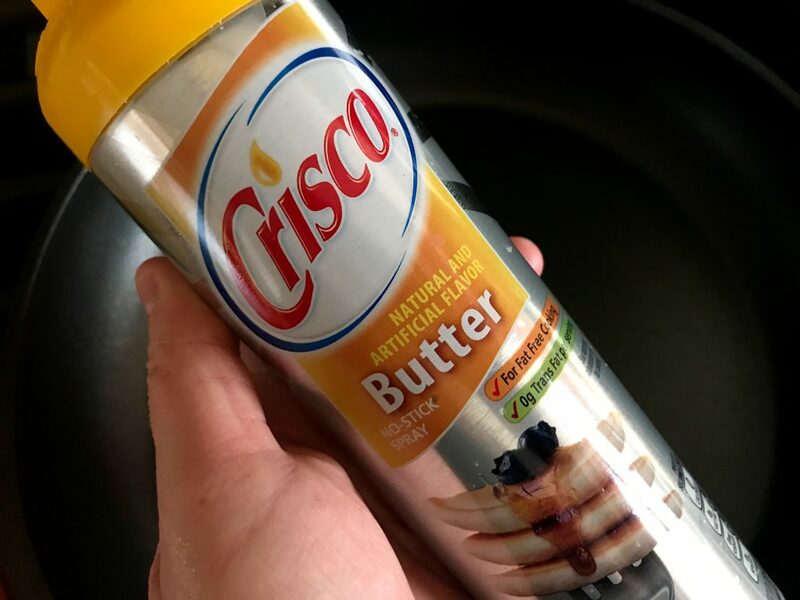 I generously spray a non stick skillet with this butter cooking spray. 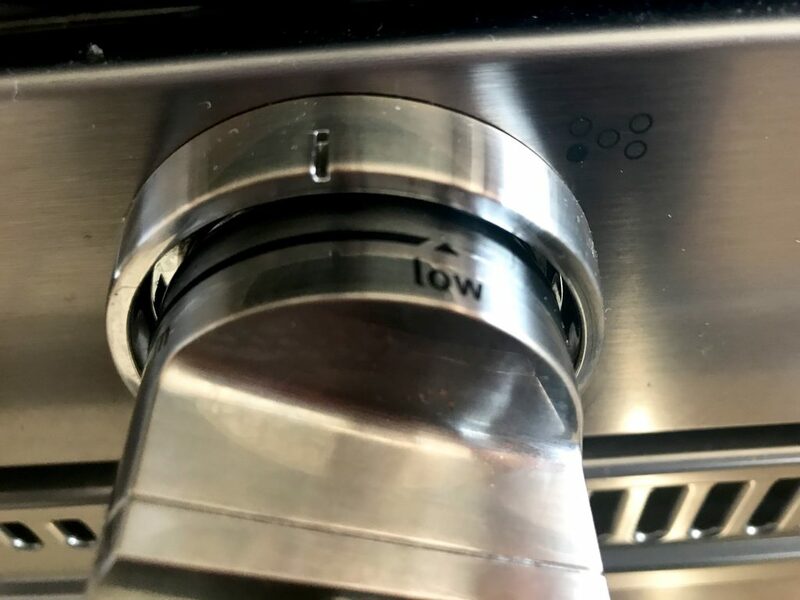 This is another reason you need your burner on low because using cooking spray and a higher heat tends to immediately burn the cooking spray and it turns brown and smells gross. Lets not do that, okay? Now, pour your eggs in and just let’m sit for a couple’a minutes. 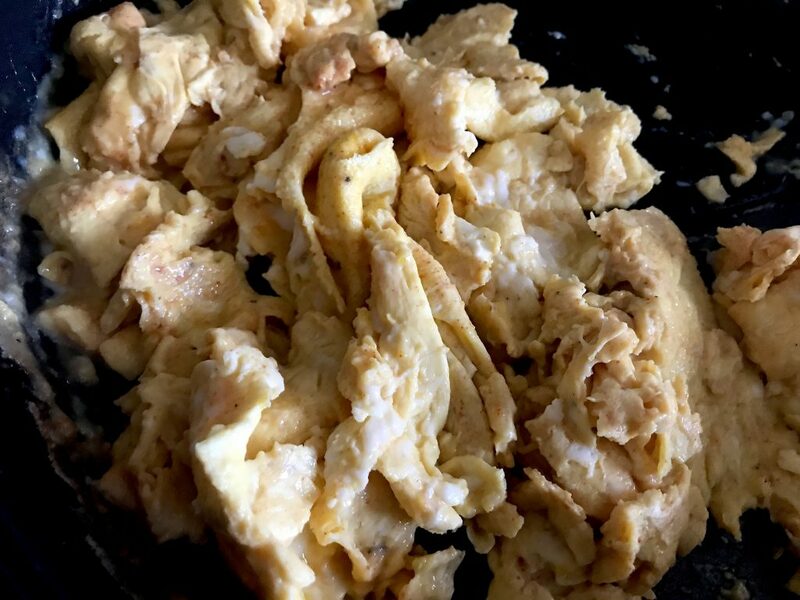 The key to getting the eggs to be more “whole” than scrambled up is to not move them around in the pan very much. 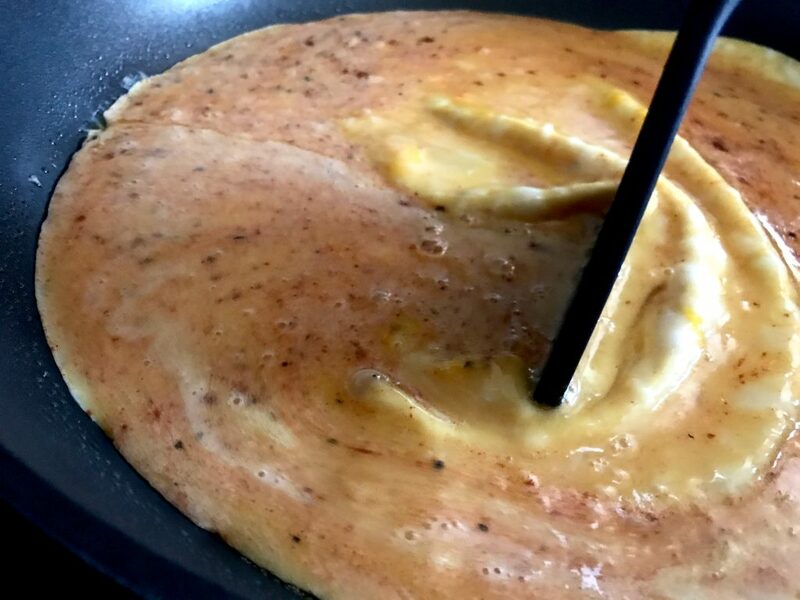 Just gently move the eggs in the pan with a spatula a few times while cooking. When you see the edges of the eggs kind of form up is when you’ll gently move the eggs with a spatula. When they get to this point, I usually flip them once. That’s probably not correct, but it’s what I do. And there we go! These actually broke up a bit more than i’d like, but they are still perfect to me. I’m not a perfectionist cook in case you haven’t noticed. Haha! Remove them from the heat and set aside. You’ll need’m in a minute or two. Now, these might seem like some detailed instructions for some eggs, and I know they kinda are, but I eat a lot of eggs now and I’ve realized that it really does make a difference on how they are cooked. 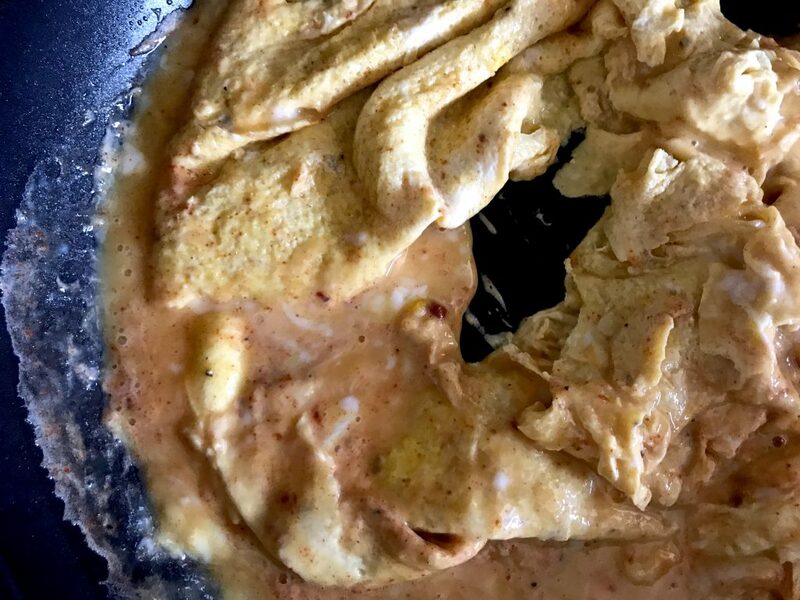 Honestly, if you have a better way of cooking eggs, then do that! But, just keep in mind they need to stack nicely on sandwich so it’s best if they aren’t “crumbly” eggs. Does that make sense? I hope so. Let me know if it doesn’t! Want to hear another little secret of mine? When the biscuits come fresh outa the oven. 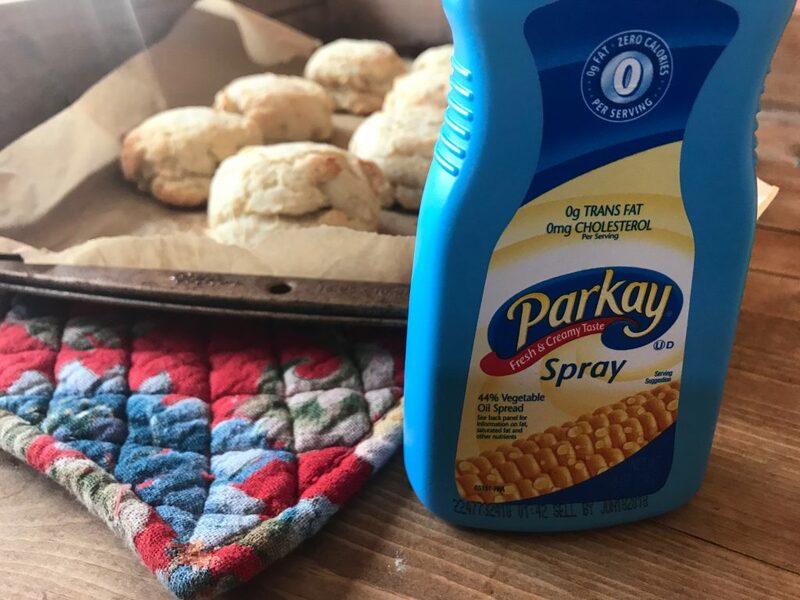 I spray the tops with this Parkay Spray butter stuff. It gives them the slightest hint of buttery-goodness. You should be able to find this stuff in any ol’ grocery store in the same place you find the butta. (P.S. I’m not sponsored by them, I’m just a fan of this butter spray stuff. I’m a much bigger fan of real butta, but you know..) I suppose you could melt down a teaspoon or two of real butter and brush the tops too. It would probably only add a few calories per sandwich, but not sure about points. I think I’ll have to try it though. See? Just a couple sprays on each will do the trick. Now, here’s where you’ve got a few options! If you’re preparing these for a big breakfast or brunch with a bunch’a friends and/or family and want to save yourself some extra work. Just put everything on a tray and let everyone grab and make their own sandwiches! It’s a breakfast sandwich bar basically and it’s the best thing EVER. I usually serve’m this way for the family first then make up the rest into sandwiches and put’m in the fridge for quick grab and go breakfasts throughout the week. Don’t forget the cheese! I use American Cheese Slices. I don’t know/care if it’s real cheese. It’s delicious and, in my opinion, it belongs on breakfast sandwiches and cheeseburgers. I use the kind made with 2% milk and I cut each slice in half for each sandwich. I’m greedy with the cheese and half’a slice is enough, I promise. Now, if you wanna make all the sandwiches up at once to put’m in the fridge for the week OR FREEZE’M for later. Just like with my “Make Ahead Freezer Friendly Breakfast Sandwiches” you’ll pretty much form an “assembly line”. Start off by cuttin’ the biscuits in half (use a serrated knife) and lay’m out. 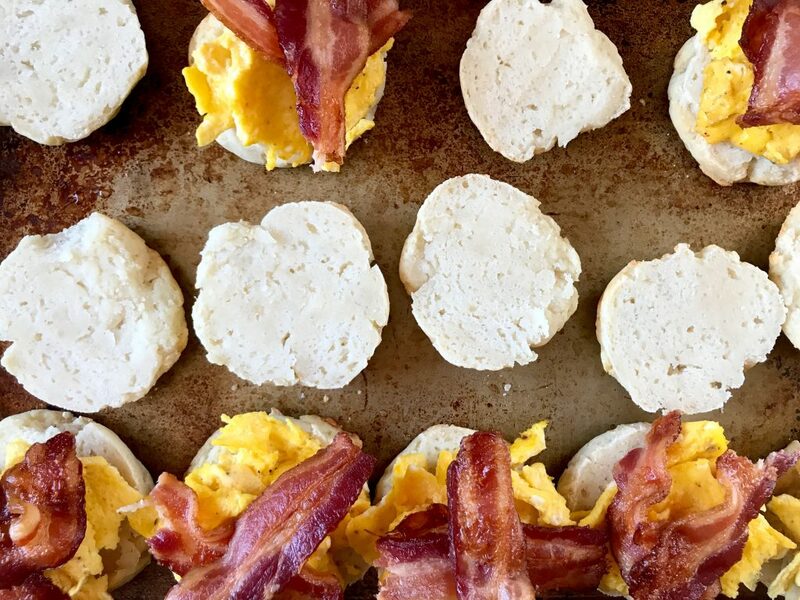 Evenly pile the eggs on top of the bottom half of each biscuit. Then add one slice center cut bacon on top of the eggs. And then, top that off with a half’a slice of American cheese made with 2% milk. Ugh, don’t they look so good? These might be my new favorite breakfast, ever. You need these in your life, I promise! One more thing, guys! 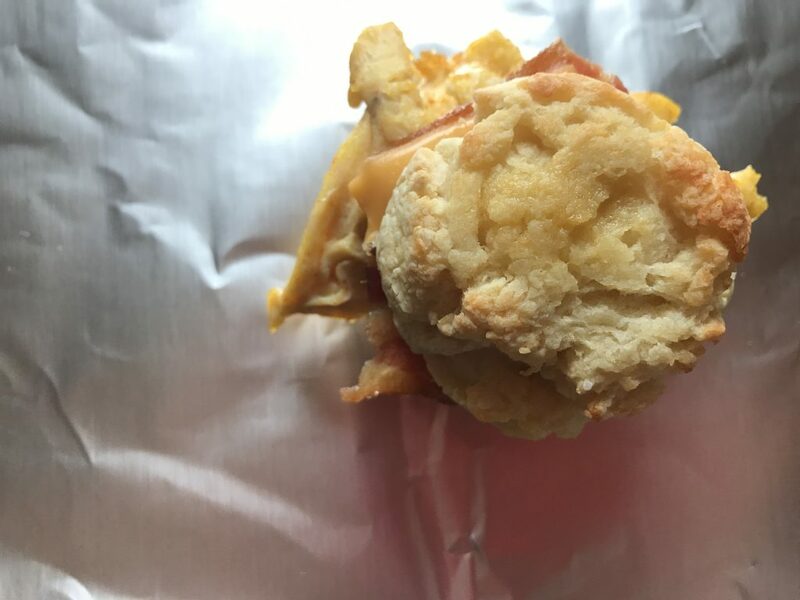 I tested these out in the freezer because I knew these would be an absolute hit if y’all could make’m ahead and freeze’m like my other Breakfast sandwiches. Throw’m in a freezer bag and toss’m in the freezer. 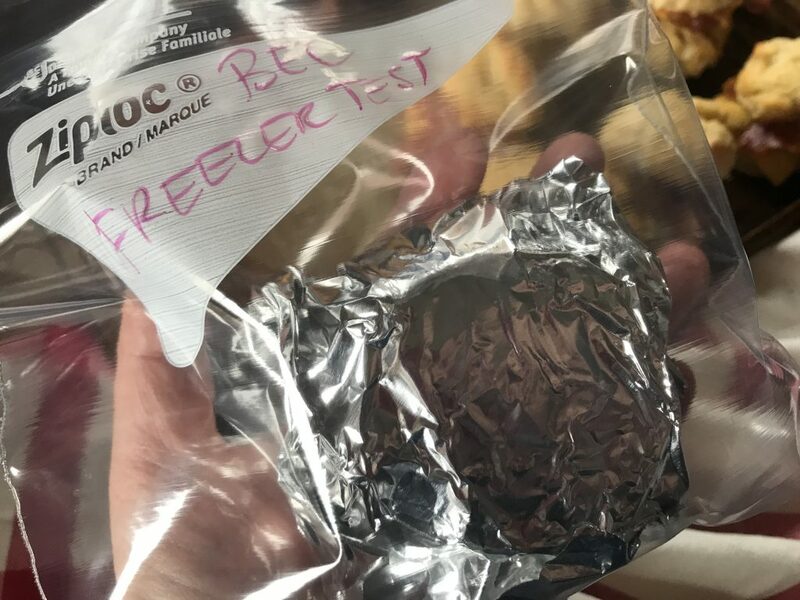 I only tested a few in the freezer because Eric, Pepper, and I ate all of the rest of’m, but the ones that went in the freezer came out FANTASTIC! We tested them side by side ones that hadn’t made it into the freezer and Eric said that he couldn’t taste the different between the two. I personally could, but I am weird. Either way, totally freezer friendly. 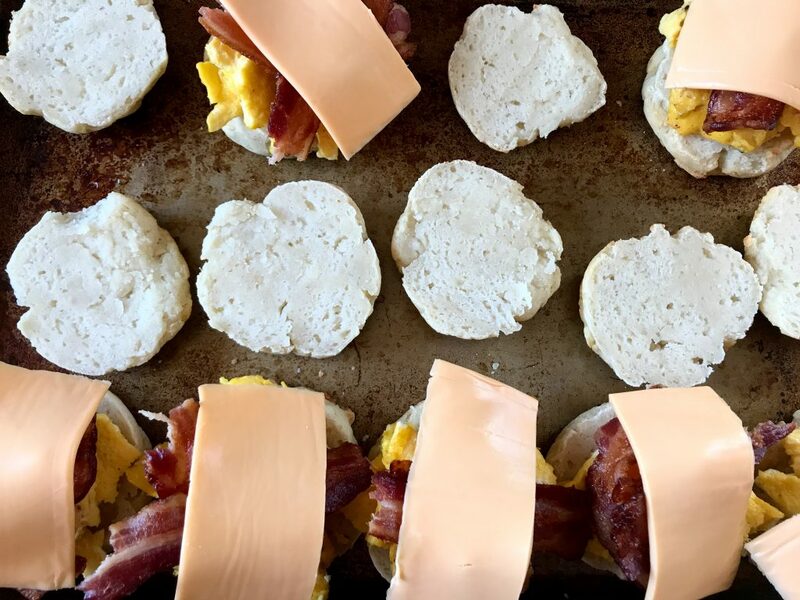 LET EGGS, BACON, AND BISCUITS COMPLETELY COOL BEFORE ASSEMBLING THE SANDWICHES, WRAPPING THEM IN FOIL, AND FREEZING! Sorry for shouting, I just want you to remember! How do I eat it after it’s been in the freezer? How do I reheat’m if they’ve just been in the fridge? Skip step one. Follow 2 & 3. Can I use Canadian bacon, sausage/turkey sausage, or ham? Sure can! Adjust your points/calories accordingly if you care about that sort’a thing! Mmm, mmm, mmm! I hope you love’m as much as I do because I really, really, REALLY, REALLY do! Let me know if ya give’m a try in the comments below! 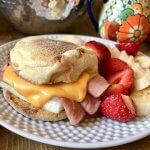 A favorite/classic breakfast sandwich lighter in calories and full of protein. 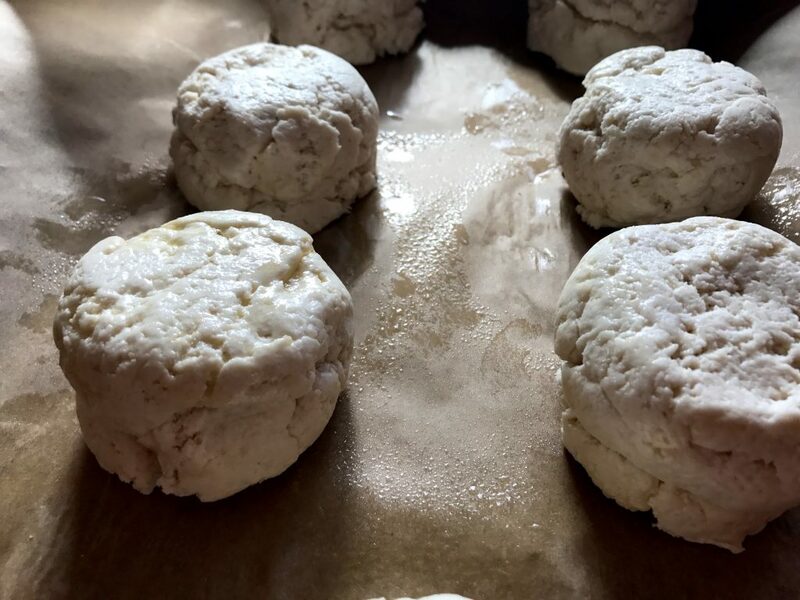 Biscuits made from scratch with two ingredient dough. Preheat oven to 400 degrees. 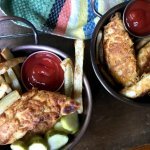 Line sheet pan (that has sides!) with aluminum foil. Arrange bacon and bake for 12-14 minutes until crispy. Line baking sheet with parchment paper. 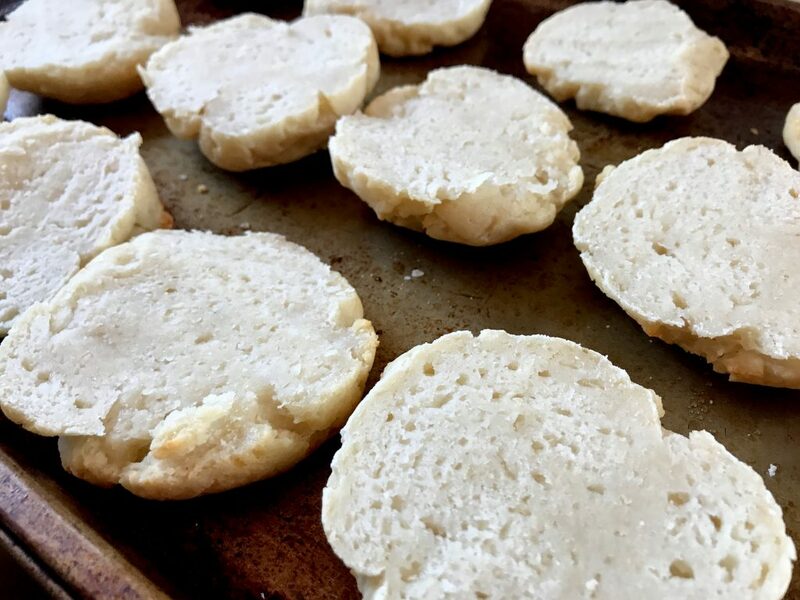 Spray 1/3 cup measuring cup with cooking spray and scoop dough and drop biscuits onto sheet pan about 1 inch apart. You'll have 9 biscuits. Spray the top of biscuits with cooking spray. 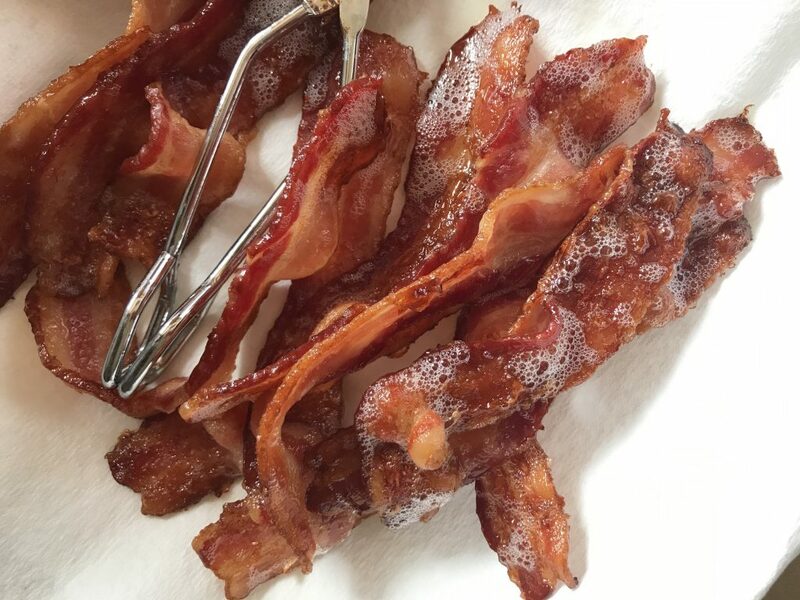 Remove bacon from oven and set aside on a paper towel to sop up a little extra grease. Keep the oven heated to 400 degrees and place biscuits in. Bake for about 24 minutes or until tops are lightly golden brown. When eggs are firm and cooked remove from heat and set aside. Remove biscuits from oven when lightly golden brown. Let cool for a few moments and cut open with serreated knife. 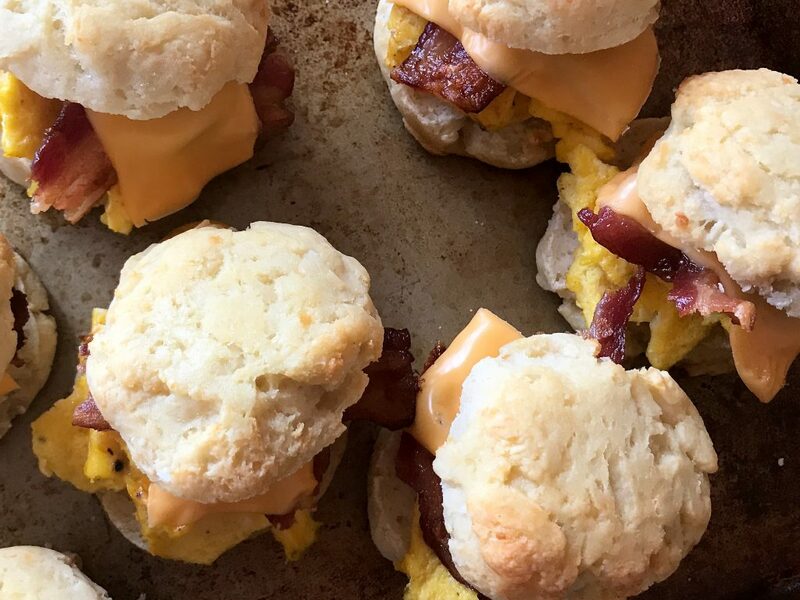 Evenly pile eggs on top of the bottom of biscuit, followed by a piece of bacon, and top with half slice of american cheese. Top with the other half of the biscuit. Repeat until finished. 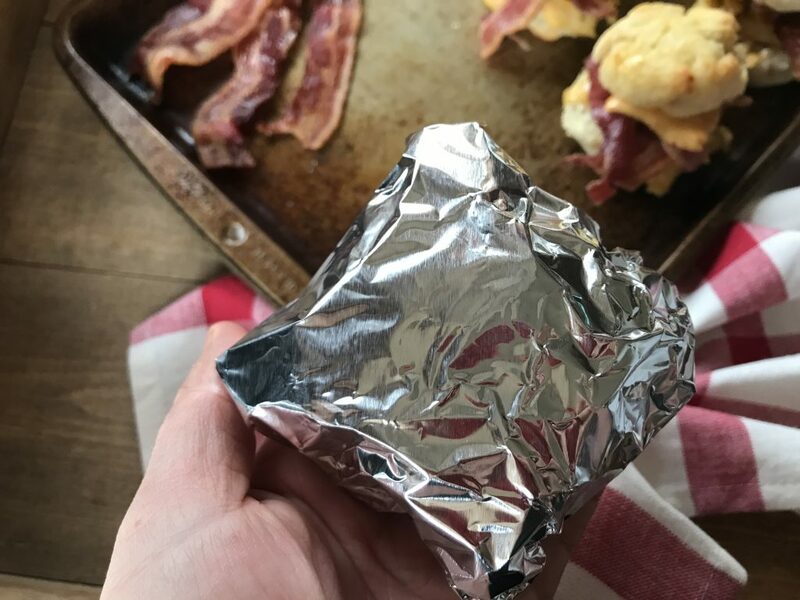 Make Ahead/Freezer Instructions: Let eggs, bacon, and biscuits completely cool, assemble sandwiches, wrap in aluminum foil, place in a freezer bag. 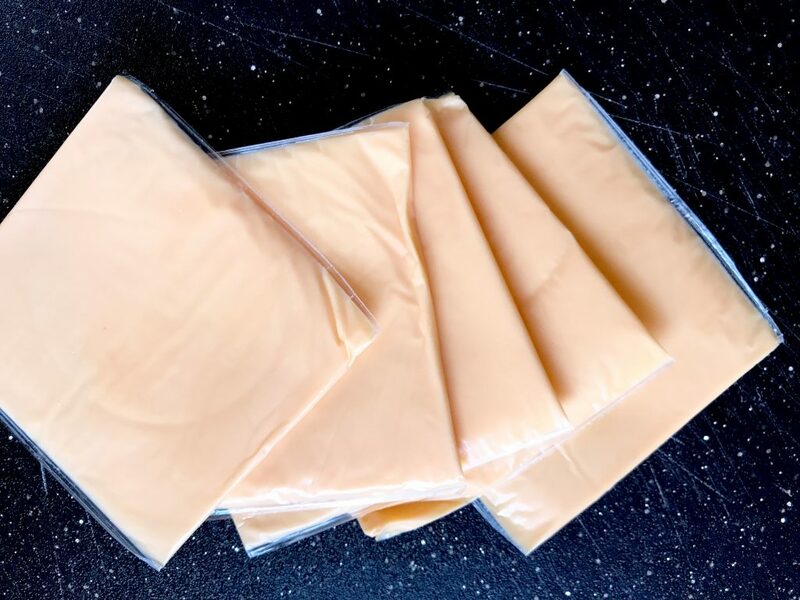 To Reheat: Thaw in fridge 6-8 hours or overnight, wrap in a paper towel, and heat for 44 seconds in the microwave. 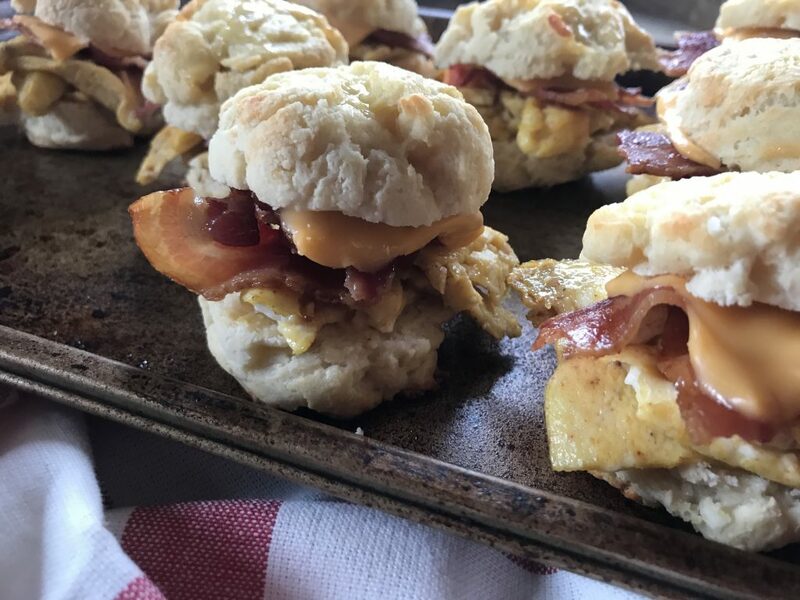 Loved, loved, loved the bacon egg and cheese biscuits! I now have them in the fridge waiting to heat up for my family for breakfast tomorrow!! Way better than McDonald’s! Thanks for sharing your recipes and your family, you’re just amazing! Oh thanks so much for those kind words, Carrie! I don’t know if they’re better than Mcdonalds….. BUT they definitely fill the void for me! Haha! I’m super pumped you think so though! Have a great weekend! What do you think the points would be if you didn’t add the bacon? I hope you have a great field trip! How fun! I want a bakery field trip. haha! I’m so happy you and your kiddos enjoy these sandwiches. We sure love’m around here too! MMMMMMMMMmmm just finished my bacon, egg and cheese muffin. Excellent, easy to prepare. Not sure any of this batch will make it to the freezer. I’m with you, I love a biscuit breakfast sandwich! Thanks for sharing. I made these for the first time last week, and I am OBSESSED now! In fact, I made quite a few of your recipes, and they are a big hit with my family. Keep ’em coming! I’m so happy you’ve enjoyed them, Peggy! You are just cute! You brighten up what is still a bit of a confused day getting my points straight. Thank you for your fun way of doing things. And for always being so uplifting! What a blessing! Awe, thanks so much for all those sweet words, Linda! I hope you are lovin’ the recipes! These are great. My biscuits were still kinda of “doughy” on the inside. Any possible fix for that? I’m so happy to hear you enjoyed’m, Sean! I haven’t had that problem really. The only thing I can guess is to just cook’m for a couple more minutes and that should help that a bit. 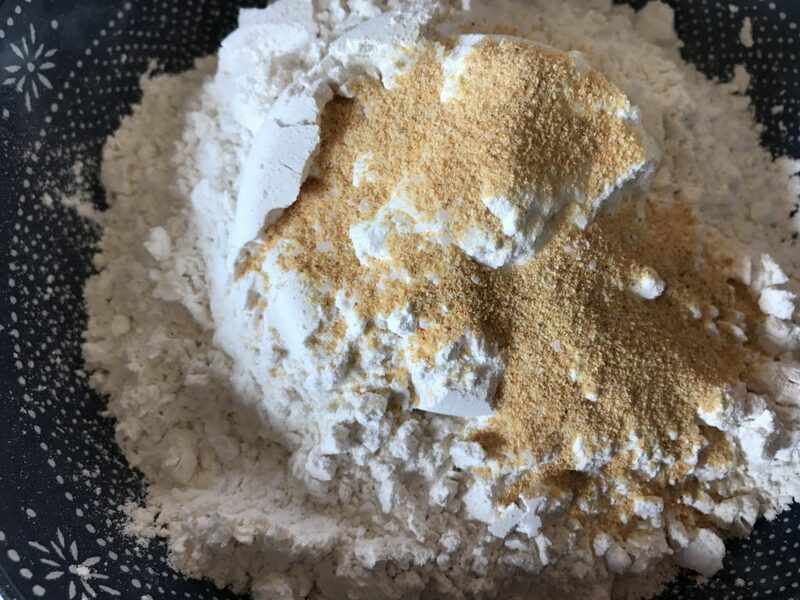 Self rising flour — will all purpose flour work? No. It’ll need to be self-rising. 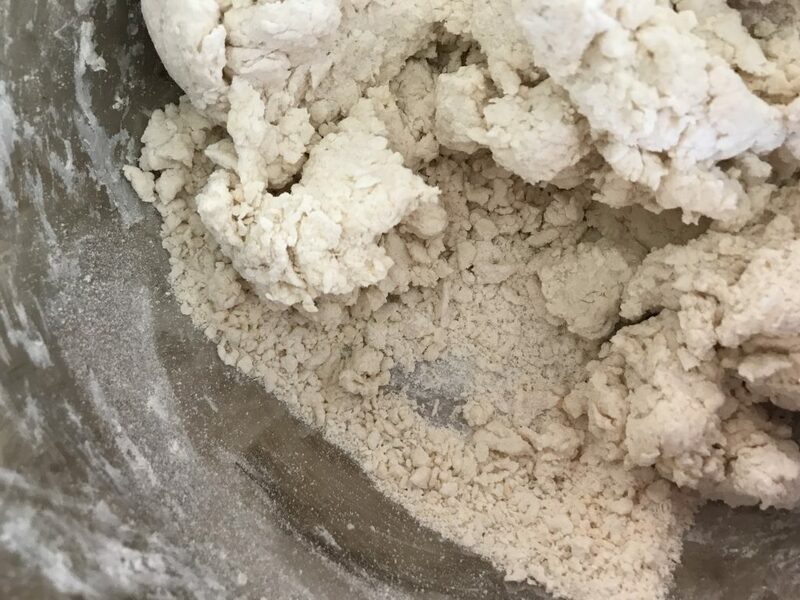 However, you CAN make your own self rising flour by adding 1.5 teaspoons of baking powder and 1/2 teaspoon of salt per cup of all purpose flour. Any advice as to why my biscuits fell flat and the insides wouldn’t cook? Second time I’ve tried the biscuits and I must be doing something wrong. 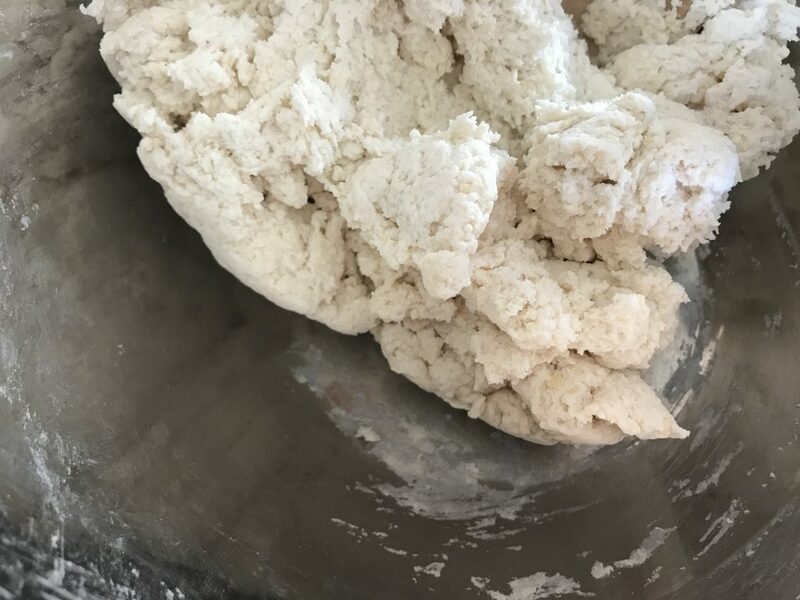 I made my own self rising flour. 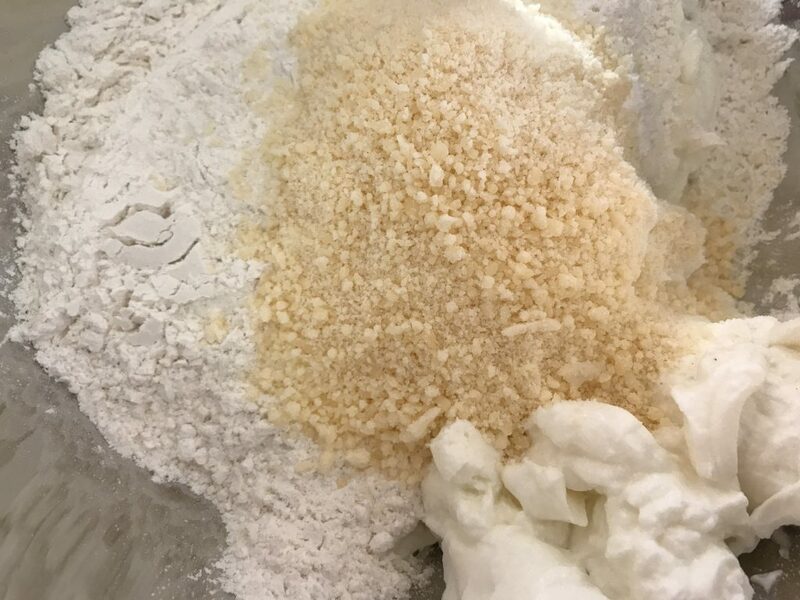 Maybe baking soda isn’t good anymore? Hi Tara. I’m so sorry these aren’t working for you. It’s possible if your baking powder is kind of old- that could totally be the case. I use Pillsbury self rising flour if that helps you at all. Are you using the correct amount as well? Thanks for replying! I bet it’s because the baking powder isn’t fresh and I just need to buy self rising flour instead of using my own. 🙂 I’m determined to get these right! I have to tell you these biscuits are amazing!!! My husbawho’s not on Weight Watchers gave them 9 out of 10 stars!!! Whoohooo! So happy to hear that! How would the points change if i used canadian bacon instead of the center cut u used? Uhhhhmmmm whoa. 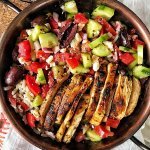 I was stalking this site after seeing a post related to your crockpot marinara on IG. It was on Kristine’s (I lost big and so can you) page. I followed the crumbs to your blog and love all of your posts. 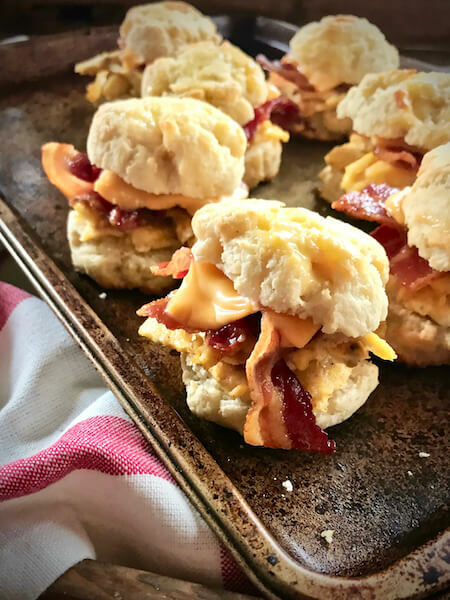 I tried the bacon and cheese biscuits and I LOVED them! I had one the next day and it was even better than the first day! In the future, I may use only 1 Tsp of garlic powder rather than 1 Tbsp, and that is only if I plan to serve them the same day. I wouldn’t modify a thing if I served them at a later time. Thank you for sharing! I made these for breakfast this morning using homemade turkey sausage (0 pts) and no cheese. They were freakin delicious! Thanks so much for the recipe! Holy crap, Star. I am making these tomorrow. Like, the moment I wake up. I’ve been obsessed with the bagels, and with garlic knots and even though my southern heart cries at the thought of real, butter filled, buttermilk biscuits, I think you just found the scratch to my itch!!! YES GIRL! MAKE’M & LOVE’M! They really do fill up the hole in my heart where buttery flaky biscuits once were. I’ve started reheating mine in my air fryer! It makes the biscuit crispy on the outside and it’s delicious! I preferred them fresh versus reheated up until now! Oh wow!! I’ll have to try that. Thanks for letting me know about that! I’m glad you enjoyed’m! These are so good! My husband really likes them too. So happy to hear, Robin! Enjoyed! I’m sure what I’m doing wrong with the salt, both times I’ve tried two ingredient dough, its really salty? Loved the paprika in the eggs! I use Kosher salt and not table salt/sea salt. If you use regular salt it can actually take the dish to a very salty level. Did you by chance use regular salt in place of kosher salt? These are awesome! I’ve made them twice and the second time I used chicken sausage patties. It’s so nice to prepare these ahead of time and have breakfast ready and waiting in the fridge. 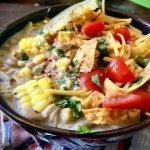 I’ve been eyeing this recipe since you posted it and finally made these this morning and they were amazing! Now I’m mad I didn’t make them sooner! Lol. 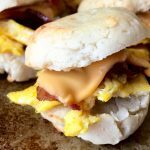 BEC is my favorite breakfast sandwich so I will be making these again! My husband even liked them and ate 2. So easy to make! Another winner the whole family has loved of yours! Perfect for the ones on the run, like I feel like a solid mom now, haha!! Keep bringing is more recipes, I’ve almost made everything this week!! I’m so happy to hear you and the family enjoy these, Emily!! Thanks for letting me know! I am so happy you enjoy, Alyssa!! Thank you SO much for letting me know and rating them! I can’t believe they are 5 points some days either! haha! These were AWESOME! I drizzled just a little sugar free maple sryup on these for a little sweet and salty flavor! YUM! So happy you enjoyed!! Thanks for letting me know!! There is one thing I don’t understand about this recipe story. What is left-over bacon and what was it doing in your frig? Ha Ha Ha! 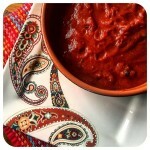 I am putting these on my list to make! HAHA! I had a lot of extra cooked bacon in the fridge because of other recipes I was working on. It normally doesn’t happen, I promise that! Omg these are so so good, couldn’t find sweet paprika so used just smoked. These will be my go to in the mornings, thank you for such a great recipe. These will so help my mornings!! 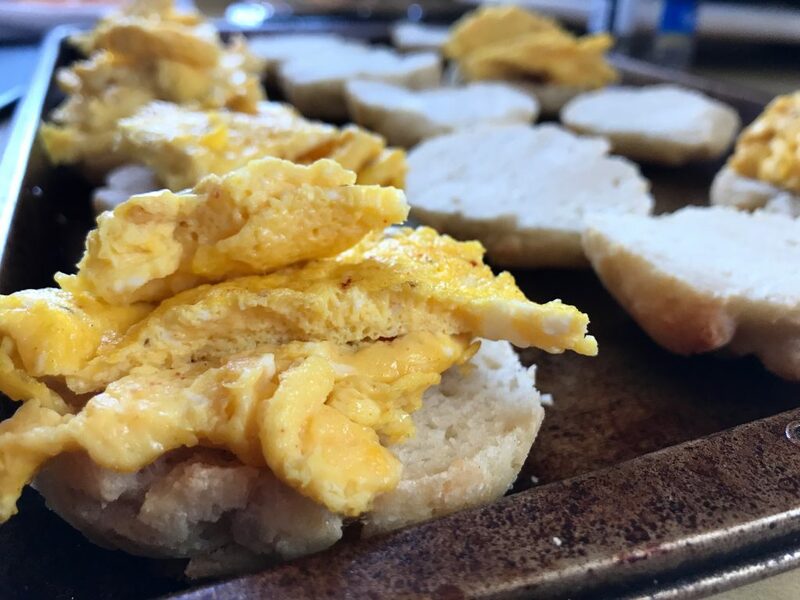 I’m curious why you use a different method for the eggs here than you used for your original freezer breakfast sandwiches on the English muffins. Do you think this method produces a better result? 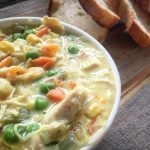 I’ve tried several of your recipes & have LOVED them all! Such a life saver to have the ww points already calculated too. Keep up the amazing work!! I wanted the feel of a good ol’ regular bacon egg and cheese biscuit which means that I wanted whole eggs. 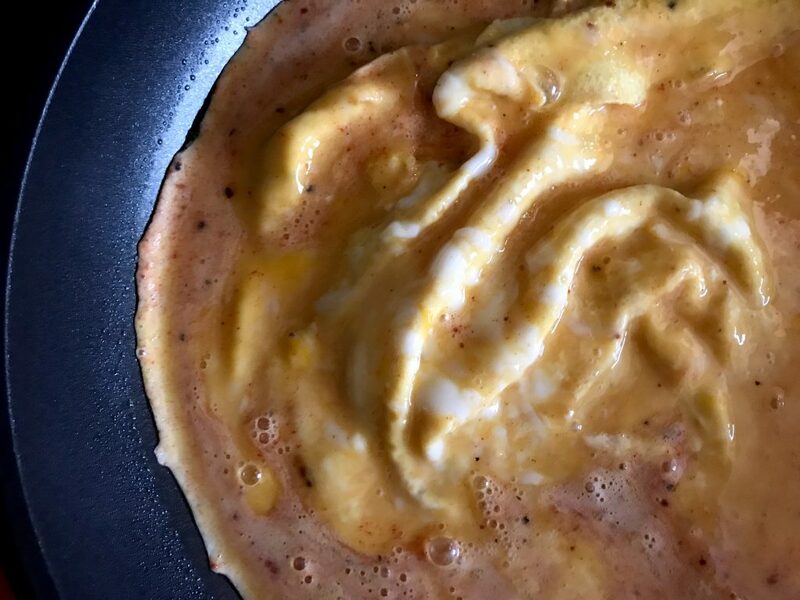 (especially since I follow Weight Watchers Freestyle) I prefer whole eggs this way, but I love egg beaters/egg whites baked in the oven liquid for that recipe. That recipe was also created before eggs were zero points on the new WW system so I went with the egg whites/beaters. Hi! So the biscuits alone are 3 points each? These look great! Can’t wait to make a batch to have on hand. I had some extra grandes around from a bubble up recipe and had to make myself just one breakfast sandwich, but it was 7 pts! Can’t wait to make these biscuits. Side note…do you think 2 ingredient dough would hold up in a bubble up? I almost tried it, but it was too late to experiment! We did 2 ingredient dough in a bubble up and it worked great! These sandwiches look amazing! I’ll be trying out this recipe really soon. Thanks for sharing! Thanks so much. I hope you love’m as much as I do! Do you use any kind of tape to keep the parchment paper wrapped around the sandwich?